Appall means to be struck or filled with fear, alarming amazement or horror. Imagine this scenario: you don’t study the whole semester and you open your books a night before the exam; you’ll surely be appalled to look at the syllabus that was covered in the last six months. 1. To be apprehensive or alarmed. 2. Reason to be unpleasantly surprised. 3. Strike with disgust or horror. 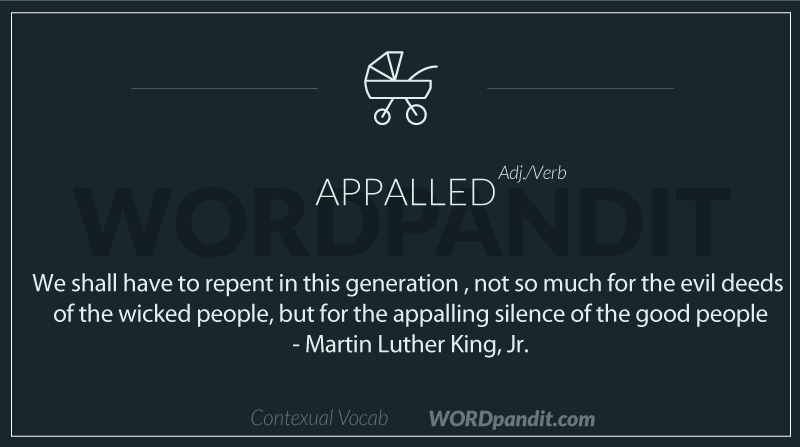 Appalled can be related to ‘apple’. We all know that when an apple fell on Newton’s head, he was amazed and struck by the idea of gravity. And now, imagine this, if ever you fall off the top floor of your home, that will be your eureka moment to realize what gravity can do to you and you will be ‘struck with horror’ in short ‘appalled’. 1. The teacher was appalled to know that her students had committed a murder. 2. The tourists from USA were appalled to see the living conditions in the slums. 3. The scandalous behavior of this married woman appalled her friends.